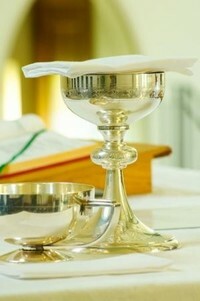 The Eucharist is “the source and summit of the Christian life”. “The Eucharist is the efficacious sign and sublime cause of that communion in the divine life and that unity of the People of God by which the Church is kept in being. It is the culmination both of God’s action sanctifying the world in Christ and of the worship men offer to Christ and through him to the Father in the Holy Spirit.” (1324-1325). In our parish we offer the sacrifice of the Holy Eucharist and do our best to foster devotion to the Adoration of the Blessed Sacrament.